Enter the Forest of Wonders and embark on a magical adventure. Click here to play! You are on the hunt for valuable forest mushrooms, and many magical creatures are here to help you. The smoking caterpillar man points the way through the Forest of Wonders, but can he be trusted? The talking rabbits seem to think so, but the cat in the tree thinks otherwise. Can he be trusted, either? Further into the forest, there is a small gnome in a massive top hat who seems friendly enough. He's surrounded by living playing cards! They arrange themselves into hands, but never seem quite sure what hand they would like to be. All of them travel in groups of five, and the gnome in the hat has to stop the higher ranking hands from bullying the lower ranked hands. He swaps cardmen in and out, always trying to achieve a balance, but he only seems to have the one deck. You had best move further into the Forest of Wonders. Three rabbits hop by, and they all seem to be carrying mushrooms and pocketwatches. You chase after them, catching one, but he sends you whirling around, watching the creatures of the Forest of Wonders whirling by. You think you see a mushroom circle in the blur, and it becomes clearer as you become less dizzy. You've found the mushroom patch, but now you must be careful which you choose, as you can only take three mushrooms on each trip to the Forest of Wonders. Choose wisely, as not everything from the Forest of Wonders is equally valued, and visiting can be somewhat expensive. Get three or more rabbits to earn free spins by clicking on the symbol. A sleeping rat symbol can fill in for symbols other than scatter or bonus symbols. It also offers high payouts for more wild symbols. 2 can earn 10 times the line bet, 3 earn 100 times the line bet, 4 earn 500 times the line bet, and 5 wild symbols earn 5000 times the line bet. 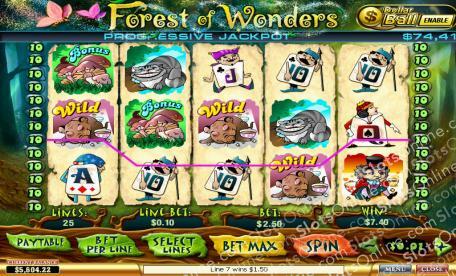 When three or more mushroon symbols appear on an active payline, the bonus game triggers. In it, you choose three mushrooms to try to get the highest possible prize. You may try up to 4 times, but don't get too greedy or you may end up with less than you could have won!